Car with Obama bumper sticker parked in violation of No Parking sign. The car directly in front of this one also had an Obama sticker and was also parked on the "No Parking" side. If these people are so eager to get to the $5 locally grown cantaloupes that they don't want to wait for a legal spot, it wouldn't ordinarily bother me, except that I got a ticket a few weeks ago for parking my car (with New York plates and no Obama sticker) in the same place a few weeks earlier. I had not seen the sign. These guys, on the other hand, were getting away with it — a police officer was hovering nearby but not writing tickets. 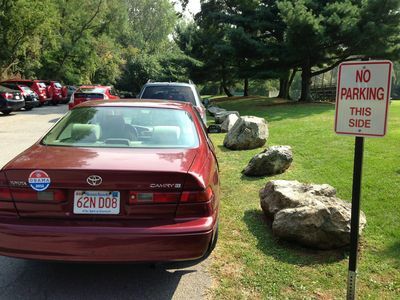 Anyway, I'm not claiming that the Newton police are biased in favor of Obama, or that Obama supporters are more likely than anyone else to park illegally. The image did make me chuckle, however, which is part of what these Photos of the Day are intended to make you do.